Seven Falls hike is one of the most well-known hikes near Tucson. Its beautiful scenery, moderate difficulty, and waterfall reward at the end are all reasons for its popularity. Due to the Tucson heat, this hike is favored between October and April. It is hiked during the hot season, however; the hike usually takes between three and four hours depending on how much swimming time you like, and it is recommended that you start before the sun rises to get back to air conditioning before the heat hits you. To start, park in the Sabino Canyon Recreation Center. From here you'll find plenty of signs to point you toward Bear Canyon Trail. 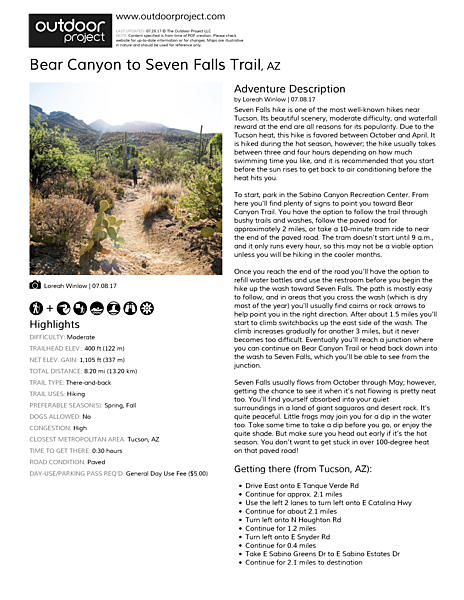 You have the option to follow the trail through bushy trails and washes, follow the paved road for approximately 2 miles, or take a 10-minute tram ride to near the end of the paved road. The tram doesn't start until 9 a.m., and it only runs every hour, so this may not be a viable option unless you will be hiking in the cooler months. Once you reach the end of the road you'll have the option to refill water bottles and use the restroom before you begin the hike up the wash toward Seven Falls. The path is mostly easy to follow, and in areas that you cross the wash (which is dry most of the year) you'll usually find cairns or rock arrows to help point you in the right direction. After about 1.5 miles you'll start to climb switchbacks up the east side of the wash. The climb increases gradually for another 3 miles, but it never becomes too difficult. Eventually you'll reach a junction where you can continue on Bear Canyon Trail or head back down into the wash to Seven Falls, which you'll be able to see from the junction. Seven Falls usually flows from October through May; however, getting the chance to see it when it's not flowing is pretty neat too. You'll find yourself absorbed into your quiet surroundings in a land of giant saguaros and desert rock. It's quite peaceful. Little frogs may join you for a dip in the water too. Take some time to take a dip before you go, or enjoy the quite shade. But make sure you head out early if it's the hot season. You don't want to get stuck in over 100-degree heat on that paved road! Waterfall. Great views. Wildflowers. Bird watching.